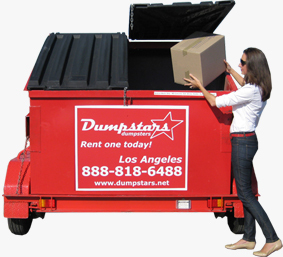 Dumpster rental in Los Angeles is simple with Dumpstars. Our innovative dumpsters are available for rental in all neighborhoods in the City of Los Angeles and surrounding cities in LA County. Click to see inside our 6 yard Los Angeles dumpster rental bin. 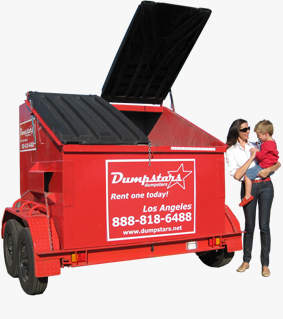 Dumpstars Los Angeles dumpster rental bins can be used for trash removal, junk disposal, contractor debris removal, garage clean outs, post party trash disposal, spring cleans, yard waste removal and much more. For dumpsters Los Angeles-wide talk to one of our Los Angeles dumpster rental staff about your job today on 888 818 6488 or 310 745 3607 for Los Angeles Dumpsters and dumpster rental requirements. 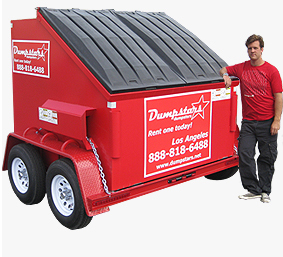 Click on the button above to get a quote and if you want to rent a Dumpstars Los Angeles dumpster or call us. Or check our dumpster prices. Our phones are answered 6 days a week. After hours the calls route directly through to your nearest dumpster rental location and will be answered by the LA dumpster rental location manager. So if you need trash hauling or a Los Angeles dumpster rental call us anytime. We can also assist with organising Los Angeles roll-off services. Our 4 yard LA dumpsters starts from $180. Our 5 yard dumpsters from $205, and our 6 yard dumpsters in Los Angeles are delivered from $230. All prices include tax. Rates vary depending on the distance from our downtown Los Angeles dumpster depot. The normal rental period is for three days but for an extra charge additional days are available. You fill the dumpster and we take the trash away. LA Dumpster Rental and Trash Removal Made Easy! and receive $10 off your next dumpster! The DumpStar dumpsters are trailer-mounted and have advantages over traditional dumpsters. 1. They cost less to rent. Our Los Angeles dumpster rental bins allow us to transport and dispose of the dumpster trash at a lower cost, which means that our dumpsters cost less to rent. 2. As all of our dumpsters Los Angeles wide are road-registered, they don’t generally require a city dumpster rental permit. 3. All of the Dumpstars dumpsters in Los Angeles have lids that can be sealed, so no unauthorized filling occurs and no one can get access to your dumpster rental waste. 4. Our dumpsters can be moved around or between Los Angeles dumpster worksites, meaning the dumpster can be moved to the trash, rather than having to move the trash to the dumpster. 5. Environmentally Sensitive: Our LA dumpster vehicles as smaller than conventional waste-hauling trucks and therefore use less energy. 6. Our dumpsters are sealed and therefore our locations can be positioned closer to where we deliver. This means we travel shorter distances, further reducing energy expenditure. This also allows us to keep our dumpster delivery costs low, with savings we pass on to our customers when they rent a dumpster in Los Angeles. 7. Our Los Angeles dumpster rental bins are generally more practical and cost efficient that Los Angeles junk removal services. 8. Our 6 yard dumpster rentals Los Angeles are unique in their size, fitting neatly between 3 yard and 20 yard general waste dumpsters. So for all your Trash Removal needs, contact Dumpstars Dumpster Rental Los Angeles.